Acquisition of the Works of the Schuylkill Navigation Co. This is one of many plans proposed between the 1860s and 1940s to pipe drinking water into Philadelphia via aqueduct. 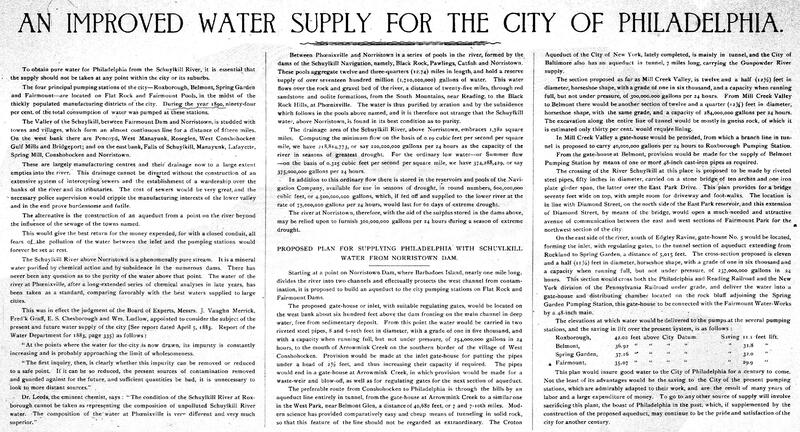 This particular plan, which proposed to bring water from the Schuylkill above Norristown, was more modest than other plans that reached much farther upstate for a clean supply to replace the polluted Delaware and Schuylkill rivers. (For earlier proposals, click here or here to open other pages on PhillyH20.) 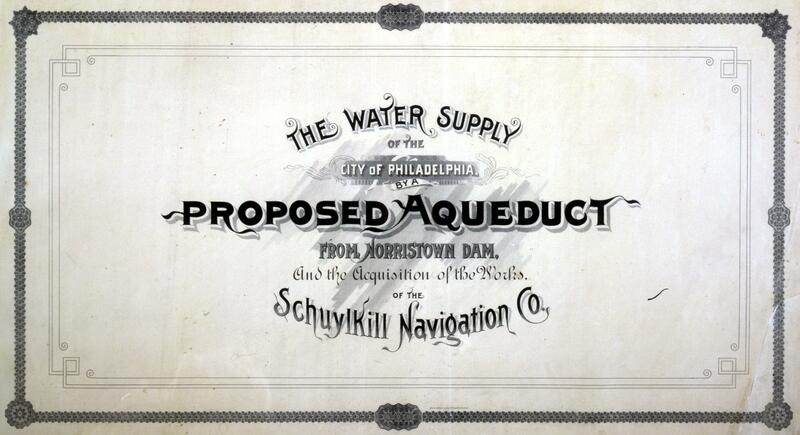 This plan proposed using the storage capacity of the river and the canals of the Schuylkill Navigation Company to assure an adequate supply of water. It was never implemented, and Philadelphia continues to this day to get its drinking water from the Schuylkill and Delaware Rivers within the city limits. and an exquisitely drawn map showing the entire Schuylkill watershed. 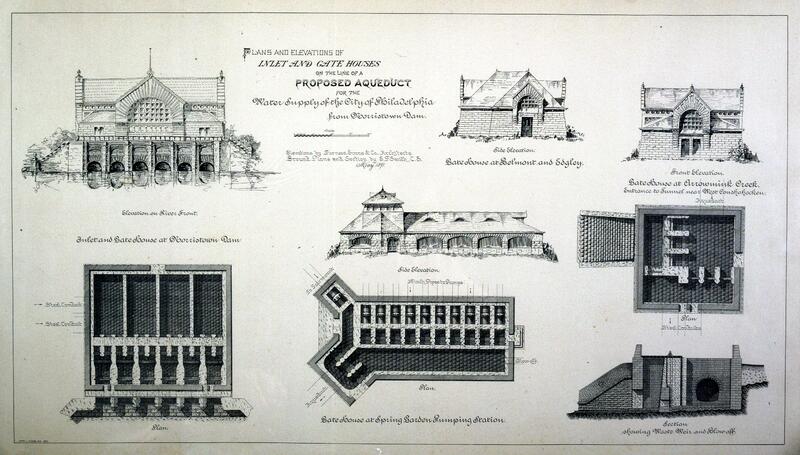 You can download these plans, from the PWD Historical Collection, at the links below. Thanks to Joe Shapiro, PWD Archives volunteer, for cataloguing these items, and to the Matt Herbison at the Independence Seaport Museum Library, which has a bound copy of these plans, the perusal of which helped us order and better understand our own disbound copies. Files range from 1 to 6 mb and may take time to download depending on your Internet connection speed. To obtain pure water for Philadelphia from the Schuylkill River, it is essential that the supply should not be taken at any point within the city or its suburbs. The four principal pumping stations of the city-Roxborough, Belmont, Spring Garden and Fairmount-are located on Flat Rock and Fairmount Pools, in the midst of the thickly populated manufacturing districts of the city. During the year 1890, ninety-four per cent. of the total consumption of water was pumped at these stations. The Valley of the Schuylkill, between Fairmount Dam and Norristown, is studded with towns and villages, which form an almost continuous line for a distance of fifteen miles. On the west bank there are Pencoyd, West Manayunk, Roseglen, West Conshohocken, Gulf Mills and Bridgeport; and on the east bank, Falls of Schuylkill, Manayunk, Lafayette, Spring Mill, Conshohocken and Norristown. These are largely manufacturing centres and their drainage now to a large extent empties into the river. This drainage cannot be diverted without the construction of an extensive system of intercepting sewers and the establishment of a wardenship over the banks of the river and its tributaries. The cost of sewers would be very great, and the necessary police supervision would cripple the manufacturing interests of the lower valley and in the end prove burdensome and futile. The alternative is the construction of an aqueduct from a point on the river beyond the influence of the sewage of the towns named. This would give the best return for the money expended, for with a closed conduit, all fears of the pollution of the water between the inlet and the pumping stations would forever be set at rest. The Schuylkill River above Norristown is a phenomenally pure stream. It is a mineral water purified by chemical action and by subsidence in the numerous dams. There has never been any question as to the purity of the water above that point. The water of the river at Phoenixville, after a long-extended series of chemical analyses in late years, has been taken as a standard, comparing favorably with the best waters supplied to large cities. "At the points where the water for the city is now drawn, its impurity is constantly increasing and is probably approaching the limit of wholesomeness. The first inquiry, then, is clearly whether this impurity can be removed or reduced to a safe point. If it can be so reduced, the present sources of contamination removed and guarded against for the future, and sufficient quantities be had, it is unnecessary to look to more distant sources." Dr. Leeds, the eminent chemist, says: "The condition of the Schuylkill River at Roxborough cannot be taken as representing the composition of unpolluted Schuylkill River water. The composition of the water at Phoenixville is very different and very much superior." Between Phoenixville and Norristown is a series of pools in the river, formed by the dams of the Schuylkill Navigation, namely, Black Rock, Pawlings, Catfish and Norristown. These pools aggregate twelve and three-quarters (12.74) miles in length, and hold a reserve supply of over seventeen hundred million (1,710,000,000) gallons of water. This water flows over the rock and gravel bed of the river, a distance of twenty-five miles, through red sandstone and oolite formations, from the South Mountains, near Reading, to the Black Rock Hills, at Phoenixville. The water is thus purified by aeration and by the subsidence which follows in the pools above named, and it is therefore not strange that the Schuylkill water, above Norristown, is found in its best condition as to purity. The drainage area of the Schuylkill River, above Norristown. embraces 1,782 square miles. Computing the minimum flow on the basis of 0.19 cubic feet per second per square mile, we have 218,814,773, or say 220,000,000 gallons per 24 hours as the capacity of the river in seasons of greatest drought. For the ordinary low water--or Summer flow--on the basis of 0.325 cubic feet per second per square mile, we have 374,288,429, or say 375,000,000 gallons per 24 hours. In addition to this ordinary flow there is stored in the reservoirs and pools of the Navigation Company, available for use in seasons of drought, in round numbers, 600,000,000 cubic feet, or 4,500,000,000 gallons, which, if fed off and supplied to the lower river at the rate of 75,000,000 gallons per 24 hours, would last for 60 days of extreme drought. The river at Norristown, therefore, with the aid of the surplus stored in the dams above, may be relied upon to furnish 300,000,000 gallons per 24 hours during a season of extreme drought. PROPOSED PLAN FOR SUPPLYING PHILADELPHIA WITH SCHUYLKILL WATER FROM NORRISTOWN DAM. Starting at a point on Norristown Dam, where Barbadoes Island, nearly one mile long, divides the river into two channels and effectually protects the west channel from contamination, it is proposed to build an aqueduct to the city pumping stations on Flat Rock and Fairmount Dams. The proposed gate-house or inlet, with suitable regulating gates, would be located on the west bank about six hundred feet above the dam fronting on the main channel in deep water, free from sedimentary deposit. From this point the water would be carried in two riveted steel pipes. 8/10th and 6/10th feet in diameter, with a grade of one in five thousand, and with a capacity when running full, but not under pressure, of 254,000,000 gallons in 24 hours, to the mouth of Arrowmink Creek on the southern border of the village of West Conshohocken. Provision would be made at the inlet gate-house for putting the pipes under a head of 2½ feet, and thus increasing their capacity if required. The pipes would end in a gate-house at Arrowmink Creek, in which provision would be made for a waste-weir and blow-off, as well as for regulating gates for the next section of aqueduct. The preferable route from Conshohocken to Philadelphia is through the hills by an aqueduct line entirely in tunnel, from the gate-house at Arrowmink Creek to a similar one in the West Park, near Belmont Glen, a distance of 40,680 feet, or 7 and 7/10th miles. Modern science has provided comparatively easy and cheap means of tunneling in solid rock, so that this feature of the line should not be regarded as extraordinary. The Croton Aqueduct of the City of New York, lately completed, is mainly in tunnel, and the City of Baltimore also has an aqueduct in tunnel, 7 miles long, carrying the Gunpowder River supply. The section proposed as far as Mill Creek Valley, is twelve and a half (12½ ) feet in diameter, horseshoe shape, with a grade of one in six thousand, and a capacity when running full, but not under pressure, of 300,000,000 gallons per 24 hours. From Mill Creek Valley to Belmont there would be another section of twelve and a quarter (12¼) feet in diameter, horseshoe shape, with the same grade, and a capacity of 284,000,000 gallons per 24 hours. The excavation along the entire line of tunnel would be mostly in gneiss rock, of which it is estimated only thirty per cent. would require lining. In Mill Creek Valley a gate-house would be provided, from which a branch line in tunnel is proposed to carry 40,000,000 gallons per 24 hours to Roxborough Pumping Station. From the gate-house at Belmont, provision would be made for the supply of Belmont Pumping Station by means of one or more 48-inch cast-iron pipes as required. The crossing of the River Schuylkill at this place is proposed to be made by riveted steel pipes, fifty inches in diameter, carried on a stone bridge, of ten arches and one iron plate girder span, the latter over the East Park Drive. This plan provides for a bridge seventy feet wide on top, with ample room for driveway and foot-walks. The location is in line with Diamond Street, on the north side of the East Park reservoir, and this extension of Diamond Street, by means of the bridge, would open a much-needed and attractive avenue of communication between the east and west sections of Fairmount Park for the northwest section of the city. On the east side of the river, south of Edgley Ravine, gate-house No. 5 would be located, forming the inlet, with regulating gates, to the tunnel section of aqueduct extending from Rockland to Spring Garden, a distance of 5,015 feet. The cross-section proposed is eleven and a half (11½) feet in diameter, horseshoe shape, with a grade of one in six thousand and a capacity when running full, but not under pressure, of 237,000,000 gallons in 24 hours. This section would cross both the Philadelphia and Reading Railroad and the New York division of the Pennsylvania Railroad under grade, and deliver the water into a gate-house and distributing chamber located on the rock bluff adjoining the Spring Garden Pumping Station, this gate-house to be connected with the Fairmount Water-Works by a 48-inch main. Roxborough, 42.00 feet above City Datum. Saving 11.1 feet lift. Belmont, 36.92 feet above City Datum. Saving 31.8 feet lift. Spring Garden, 37.1 feet above City Datum. Saving 32.0 feet lift. Fairmount, 35.7 feet above City Datum. Saving 29.9 feet lift. This plan would insure good water to the City of Philadelphia for a century to come. Not the least of its advantages would be the saving to the City of the present pumping stations, which are admirably adapted to their work, and are the result of many years of labor and a large expenditure of money. To go to any other source of supply will involve sacrificing this plant, the boast of Philadelphia in the past, which, if supplemented by the construction of the proposed aqueduct, may continue to be the pride and satisfaction of the city for another century.